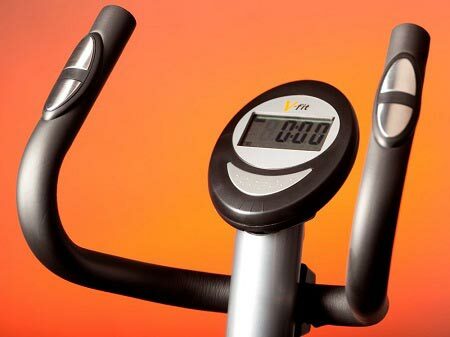 The V-Fit brand provides affordable elliptical and cycle trainers, but the V-Fit MCCT1 is different. 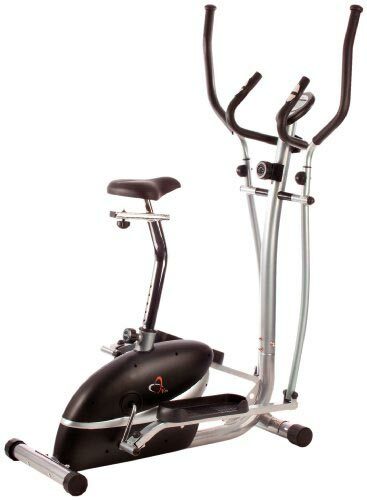 This model acts as a 2-in-1 that offers both an exercise bike and cross trainer – all in one low-priced machine. For anyone that is trying to get fit at home, this is an exceptional design. Before we go into the details about this machine, I want to show you a few of the features and specs that this model has to offer. The MCCT1 packs a lot of functionality into one machine. First, the machine uses a flywheel that weighs 4.5 Kg. This wheel is meant to produce little-to-no friction, allowing for fluid movement with each cycle. Setting up the machine requires you to adjust the saddle. The footplates and pedals are both oversized to fit users of all sizes and are coated with a non-slip material. Magnetic resistance can be adjusted with the knob that is directly in front of the user. Using magnetic technology, the resistance is quieter, and a smoother exercise is performed. The 8 resistance levels are great for beginner and advanced users that want to get in a workout that boosts cardiovascular health and stamina while also allowing for muscle growth. Fixed bars to concentrate on speed and balance. Use the free-moving arms to tone the upper body and core. The user has the option of which handlebars they want to hold onto during an exercise. The handlebars both have a pulse sensor on them, and will allow for your pulse to be displayed on the LCD display. The one thing to note is that the monitor does require two AA batteries to operate properly. Users can weigh up to 110 Kg and operate this model safely. When going to assemble this model, all of the tools are provided by the manufacturer which makes life a lot easier if you don’t happen to be a D.I.Y kind or queen. The instructions are fairly easy to follow, and assembly takes about 1 to 1 ½ hours to complete. The monitor is my only real complaint as the pulse monitoring doesn’t seem to very accurate most of the time, but this could be due to swaying back and forth during a workout. It also seems that when the batteries get low, the accuracy of the monitor really suffers. A plug-in design would have been much better, like the NordicTrack E9.5. Aside from this minor complaint, this is a model that is very durable, easy to setup, and does provide an impeccable workout. The cycling is smooth, and even when on the elliptical, the steps are fluid. With the added magnetic resistance and ability to use the free-moving handlebars, users won’t have an issue burning fat and gaining muscle on the V-Fit MCCT1. If you like the idea of 2 in 1 cross trainers then we have some more featured in our home cross trainer guide.